I’m a happy camper after yesterday’s full day and I have no complaints, I couldn’t sleep yesterday so up by 5:30, and then on the road to lunch with my favorite model, stop by the lab and finally get home…., all on the bus. I’ve reverted to the early adulthood mode of travel, taking the bus and then walking the last little bit, 3 or 4 blocks sometimes. We’ve got early prototype mass-transit where I live, at the best of times it’s a thirty (30) minute wait unless you are lucky to be on a rapid line then every fifteen (15) minutes and then rounding out an hour wait if you live on a little used line, I had a mixture of both. First was the lovely lunch which I was only fifteen (15) minutes late for, my friend was all pretty in pink scrubs and she was looking over the menu when I arrived. I told her I was thinking of metal prints and they had four (4) different finish’s and I told her all about them from the little I know. Then I told her about the gallery I’m going to try and about the group show I’m going to trying to get. Laid out all the plans and daydreams I have in the works. Then a nice walk to the bus, a forty-five (45) wait and off to the lab. Another forty-five (45) minute wait and I was on the way home after another short wait for the final two buses. So today was my day to recuperate, so after the usual morning start I did my yoga routine for an hour of stretching my sore body. I had about a twenty (20) minute wait under the trees, so I had plenty of time to do some “wander” photos with my phone. So I walked down to the bus stop which is in a side yard of a church. 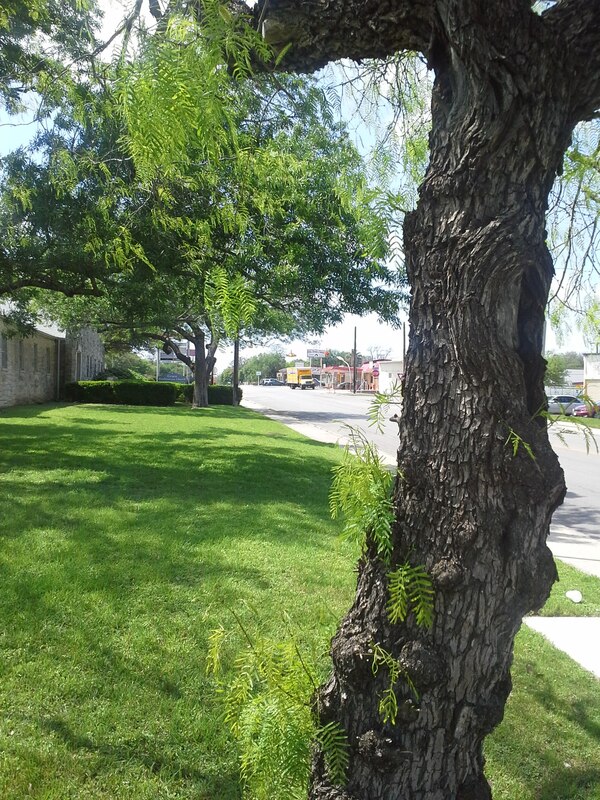 Mesquites come in lots of sizes and shapes, no two are the same like fingerprints. Spring has sprung weeks ago and now things are bright with new growth, weeds are back with a vengeance as I continue to keep paths open in alley wanders. Some neighbor have gotten to know me and wave or talk about the weather. Others not so much, as they say, been in the same house for going on 11 years now. And walking the alley for the last three, all the dogs know of me anyway. Like the owners some bark and one coward goes berserk charging the gate, until the day I saw him trying to get passed the barrier holding it in. As I hurried back the dog ran back down its driveway and barked it’s frustration as I secured the gate. Obviously a crafty animal as the fence in place’s of pasted successful attempts has been reinforced leaving one to wonder if it has found a new sneaky way out. Intelligence at work and you have to admire the dedication and fear it a little as well. One part of the adventure’s of the wander, encounters both pleasant and not. More about other adventures as we go along here. Spring has so many colors and some of the best are abloom.